(Nanowerk News) A new material that mimics coral could help remove toxic heavy metals like mercury from the ocean, according to a new study published in the Journal of Colloid and Interface Science ("Self-curled coral-like γ-Al2O3 nanoplates for use as an adsorbent"). The researchers, from Anhui Jianzhu University in China, say their new material could provide inspiration for other approaches to removing pollutants. Toxic heavy metal ions like mercury, lead and arsenic are released into the water through human activity, including manufacturing and industrial processes. One major source of toxic metal contamination is the ocean. When mercury pollutes the water, plants and animals absorb it. The mercury builds up in the food chain, ultimately resulting in toxic fish. According to the WHO, between 1.5 and 17 in every thousand children living in selected subsistence fishing populations showed cognitive impacts caused by the consumption of fish containing mercury. Heavy metals are also toxic to corals: even at low concentrations, small amounts of heavy metal pollution can kill corals. This heightened toxicity is due to coral being very efficient at collecting, or adsorbing, heavy metals. The researchers behind the new study have taken inspiration from this and developed a device that mimics the way coral adsorbs heavy metals. 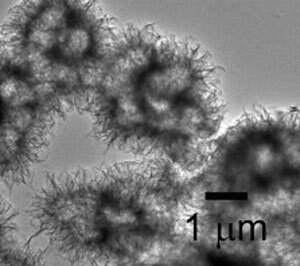 Dr. Xianbiao Wang and colleagues have made coral-like nanoplates using aluminium oxide, with the aim of adsorbing mercury from water. Aluminium oxide has previously been used to remove pollutants, but the structure of the material has not been optimal, so they have not performed very well. The new nanoplates curl themselves up into a coral-like structure, which behaves in a similar way to real coral, making the material more effective. The researchers tested the coral-like nanoplates on removing mercury from water. They found that the coral-like structure removed around 2.5 times more mercury from water than the traditional aluminium oxide nanoparticles.